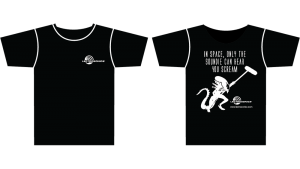 This t-shirt designed as a give-a-way for Lectrosonics customers which are mainly location sound people for TV and film, is a play on the popular movie tagline for the Aliens movie. In Space Only The Soundie Can Hear You Scream. Soundie is the gender neutral term for "sound guy". This works on a couple levels in that without the soundie the movie goers would never hear the screams.